Rarely a day goes by that I don’t put on exam gloves. Most days it’s at my job as a sonographer (ultrasound tech), but there are many days I use them in the kitchen where they are surprisingly useful. I prefer exam gloves over food-handler gloves (the clear, one-size-fits-all kind you see in restaurants and schools) because they fit more snugly and allow better tactile manipulation. I buy them at Costco for around $10 for 2 boxes which will last me between one and two years. You can also buy them in the medical supply section of almost any drugstore or grocery store. Here are some ways I use them. Can’t wait to hear your ideas. This is one of my favorite uses–especially as I get older. Exam gloves have wonderful insulating properties…to a point. 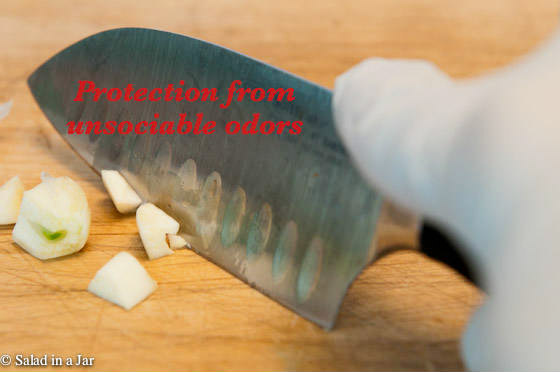 Don’t use them to remove hot dishes from an oven. But if you are slicing hot meat, turning out hot muffins or baked goods, or handling hot veggies (perhaps hollowing out cooked potatoes or stuffing an eggplant), gloves will allow you to do it quickly and cleanly without burning your fingers. The little tart shells have just come out of the oven and without gloves they would be difficult to handle. The corn on the cob you see above was cooked in the microwave per the instructions seen here, so that cob is HOT! You could use hot pads to hang on to the shucks, but they are awkward. I suggest exam gloves to make the job easy. By the way, if you haven’t seen this You Tube video about how to cook and shuck corn with no husks in the final product, you must! I’ve tried it and my life will never be the same. I’m eating more fresh corn on the cob than is probably good for a person. When working with pastries that tend to be difficult as they get warm, e.g. pie crust or puff pastry, put on gloves to protect the food. If you are rolling cookie dough into balls or making candy, gloves will prevent your body heat from warming the dough and making it too sticky to handle. Works with ice cream balls, too. If you don’t want your hands to smell like garlic or onions when you shake hands with the President after fixing his next state dinner, wear gloves. Ever chop a fresh pepper and then rub your eyes? Believe me. Wearing gloves is a very good idea. I don’t recommend making one of the most popular recipes on this blog without them. 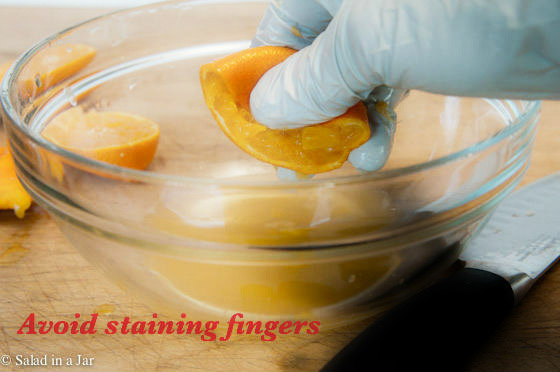 Peeling beets, squeezing citrus fruits, and extracting seeds from pomegranates or cherries are just a few of the times you might want to protect your fingers from food stains. It’s also a good way to avoid black fingers when polishing your grandmother’s silver. I’m sure you’ve already thought of this one but had to mention it anyway because it’s probably the number one reason I put these gloves on. Some tasks are just better suited for hands. As we used to say at the Greenhouse (previous job), “Hands were made before spoons.” But some jobs are ickier than bowls of mysterious substances in a Halloween fun house. Filling pasta shells and mixing meatloaf or meatballs are just two of the many messy jobs made more tolerable with gloves. P.S. My 3 yr. old grandson begs to put these gloves on every time he comes for a visit. I’m not really sure why they appeal but they seem to turn on his imagination. I and defiantly a fan of using exam gloves, I do household cleaning for a living, and my hands dry out quickly. I have up to 3 boxes(I use them in other areas of my house besides the kitchen). They are helpful for anything from moxing meatballs/other sticky food, preparing raw meat to handling hot peppers. Also them to clean the house, in the garden and miscellaneous tasks I get boxes of long cuffed nitrile gloves. High five for exam gloves. I get mine at Costco. Haven’t seen the long cuffed ones before. Just this week I was using them to pick very hot meat off the bones of a chicken or turkey. Have a great week. I get mine from Amazon. Just used a couple separate sets(one to pull hot brisket and the other to clean the bathroom) I hate it when water gets into your glove(s), I prefer the long exam gloves over the yellow household gloves. I’ll look for them. Thanks, Kyla. 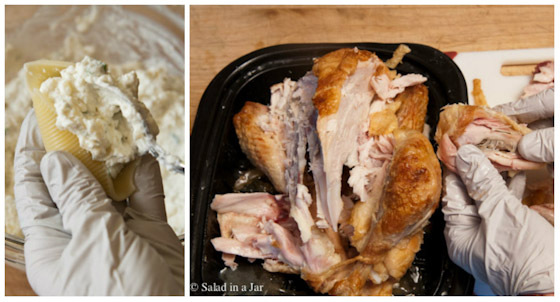 Great and creative ideas for using disposable gloves in the kitchen, especially opening jars. I would add that instead of costco consider a sites like ours With coupon codes you can get a case a gloves for about what you would pay for two boxes. I love your idea for tough-to-open jars – I will try that! I just started wearing vinyl disposable gloves, and they have saved my hands. I used to keep them on hand for the occasional jalapeno chopping – just touch your eyes once and then try putting your contact lenses in the next day – and that’ll cure you of that! hehehe. I thought to try the gloves more regularly because (embarassingly), I have to wear Mavala Stop nail polish or I’ll bite my nails, and I noticed that I could taste it when I shredded chicken or ham. I finally thought of wearing gloves, and it did the trick, but it also solved a problem that had been plagueing me for years – super dry, cracked hands. I cook from scratch up to 3 meals a day, and while I’m not really obsessive about germs, I do wash up at the obvious points – before emptying the dishwasher, after handling raw eggs/meat, or taking out the trash, and plus they just get really dirty and require frequent handwashing during cooking. As a result, my hands have been a hot mess for a while. I tried all sorts of awesome tips that helped – vaseline and cotton gloves at night, wearing dishgloves when handwashing dishes, and Eucerin Original lotion – but they were still always looking really beat up. Disposable gloves have immediately restored my hands. Almost overnight (just like it happens when I’m on vacation and not cooking), my hands are fine again. And gone are the micro-cracks and cuts (which were a result of having dry skin) that I worried were letting in e-coli or salmonella when I was handling raw meat. My skin is completely restored. I put the disposable gloves on before I start my food prep and wear the same pair until I sit down for our meal. I’ve noticed absolutely no problems working with heat, washing them repeatedly, and they even fit under larger kitchen gloves, though I don’t find that I need those anymore. I then put on another pair before I start cleaning up. I’ve tried two different brands, and the difference was enormous – the key for me was getting a tight enough fit. My current box is too loose, so water gets in them when I’m washing my gloved hands or doing dishes, and this makes them really annoying to wear. They still work fine and the water isn’t damaging my hands, but between the looseness and the water, I have to fight the urge to take them off all the time – lol. This is just from a slight difference in fit; they’re still tight enough to work in. This current box is also powdered and I don’t care for that. So I would advise that the fit is really important. These gloves sound wonderful. Are they easy to slip on and off or do you have to tug and pull to take them on and off? If your hands are completely dry and you buy the appropriate size, they are not difficult to put on. As long as they’re vinyl and powder free, you can use them with food. But if there is powder, no good. We sell a wide variety of exam gloves at affordable prices. We ship anywhere within the 48 contiguous United States. Check us out! So glad you confirmed that I’m not a crazy person like my family thinks…they make fun of my gloves but I’m the one who doesn’t have raw meat, bits of dough or rotisserie chicken under my fingernails! Another fun use at Halloween…fill with water, add red food coloring (or whatever color matches your decor), close it up and freeze it. Create a Halloween punch, remove the glove from the frozen “hand” and let it float in the punch bowl..creepy! I’m filing away the Halloween idea. That’s great. Thanks for taking the time to share. Just found your blog and I’m enjoying it. In the winter, when my skin gets extra dry, I put lotion on my hands and then put gloves on before washing dishes, cooking, etc. I used to avoid using lotion because I didn’t want to get it on everything I touched and have to wash it off when I needed to do things in the kitchen (especially touching food). Now I can moisturize whenever I want without worrying about that. Great idea Jennifer. Thanks for adding to the conversation. Just found a reference to your website on Susan Voisin’s Fat Free Vegan Kitchen. I’ve really enjoyed “looking around” and reading the comments from other readers, especially the one from the lady with the omnivore husband. Since my husband and I are Vegan, we cannot use all of your recipes, but some can be adjusted. And the ideas, such as this one, about using gloves is inspired. Also enjoyed reading your suggestions about kitchen utensils. I have some of them, and especially like my pastry scraper. I use mine primarily to scoop us my chopped veggies to transfer them from the cutting board to the pan. Thanks for having such an interesting, useful website. I have arthritis in my hands and handling cold hamburger meat really makes my hands ache. So when I am making out hamburger patties, or mixing & shaping a meatloaf, I pu on a pair of the “dr. gloves”. They keep my hands from getting cold & achy, & make for really easy clean-up. I have to agree w/Angie above-I hate the thought of touching chicken with my bare hands. We also use them when putting up bushels of chile, life saver for burning your skin while peeling and de-seeding them. I LOVE using gloves to cook, especially when making meatloaf. Can’t stand touching raw meat and wearing the gloves makes that job absolutely simple — with no mess. YAY! I like the gloves’ protection when I’m skinning tomatoes for canning. They really do protect somewhat from the heat of the water the tomatoes are sitting in and when using them for other foods in the kitchen, I also wash my “hands”, gloves and all with soap and water. Good idea about the tomatoes. I’m amazed how much gloves help when you need to handle hot food. 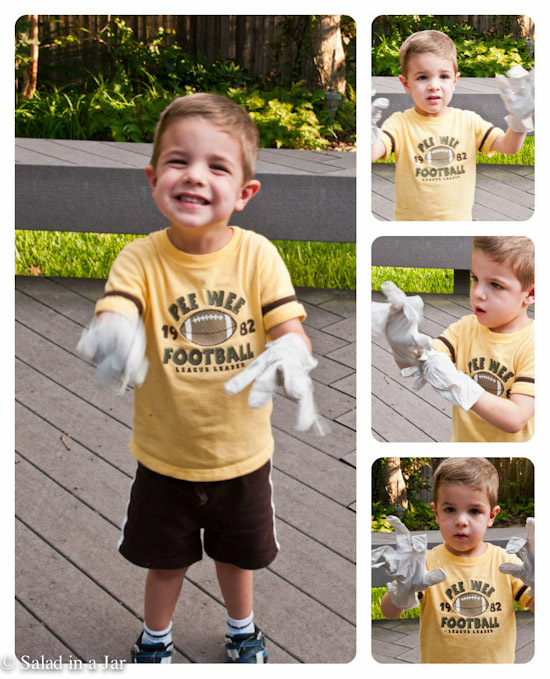 Your picture of Kent with the gloves reminded me of a cute trick my grandkids really liked when they were pre-school age. I had a macaroni box with the cellophane window in half of the box. When I had used about 2/3 of the contents, I discovered that when I turned the box upside down, the remaining macaroni “disappeared” in that little window. I called it the “magic box”, and they loved to get in the drawer pull it out. (Of course I did have to tape the box shut.) That macaroni was about 2 years old when I finally threw it away. I use them for dying my hair and when using cleansers. I also keep a pair in my purse when visiting family to help wash dishes if they serve a food I can’t stand. My husband wears them when handling garbage bags. I have been using these gloves for years. Started with mixing meatloaf, realized that most raw meat, egg, and general “messy food” handling would be safer and easier to clean up when I use gloves. Dismantling a supermarket roasted chicken is my latest favorite use. Also want to say that I will frequently wash my hands (still in gloves) when moving raw foods around or switching to new cutting boards. They fit so well that you can “clean up” and move on to a new job without wasting many pairs on one meal. I’m going to have to check the box I keep in the laundry room next to the guest bath. I doubt they are multi-purpose so I may have to switch because I love your ideas for use in the kitchen! Found you through the yummy life. 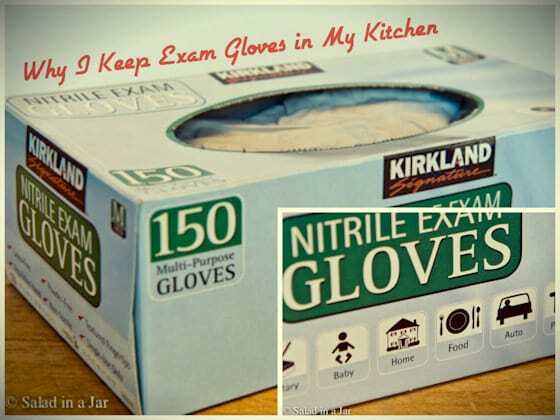 I’m so excited to try making some salad-in-a-jar and found this post on exam gloves a happy bonus! Thanks for the great stuff you’ve got on your site! I have luckily, through what must be serendipity, found your blog and am thrilled, thrilled, thrilled. Thank you for all the time and energy you devote to making it easy and more immediately scrumptious for the rest of us! I have struggled with using throw away gloves because they rip so easily but, I have been purchasing prepackaged and colorful ones. Never thought to use good old exam gloves! Thank you! Thrilled to see someone else using these. When I got married I was 100% vegetarian… My husband was 100% meat eater, red meat every day. I had never even bought raw chicken before!! I prep all our meat with these gloves on = my husband gets great meat dishes + I don’t spend all my time throwing up or scrubbing my hands. Perfect for mixing and rolling meatballs etc. Okay, so I went to the garage and dug out my box of gloves from the painting supplies cabinet and put the box in the kitchen. Now if I can just remember where I put them when I get ready to paint again. Gr eat post, great ideas and an adorable grandson! I use these gloves for most of the same reasons you do. I also wear them when I make my homemade hamburger patties. I scoop up the required amount of meat with my measuring cup and pat the patties together with these gloves on. Works wonderfully and simply toss the gloves when the patties are packaged and ready for the freezer. I totally forgot about using these gloves to apply a rub. You are so right. Thanks for the reminder. Great ideas, I have a box sitting in my kitchen drawer, left over from my now 24 year old sons last hs biology class, now I know what to do with them, never though about using them when cooking what great ideas. Great list! I think #5 is incredibly important. 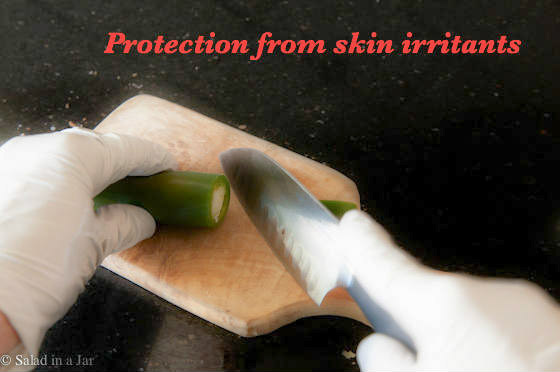 I once had burning fingertips for 2 days after chopping up hot peppers (to my dismay no natural home remedies would remove the oils). Never again! I always wear gloves now! I made that mistake once too. But only once! Thanks for the confirmation. Some great ideas for using the gloves, I would have not thought of half of them, I can’t think of any more. Welll maybe I wouldn’t cut myself as much as I do, I tend to be a bit klutzy. Klutzy? I find that hard to believe. Have a good Labor Day. Love it! I’ve tried some of the heavier “kitchen” gloves but hated how big and thick they are for some of the small intricate things we do in the kitchen. I had not thought of using this type of gloves like this in the kitchen, but you can bet I will be picking some up. I especially hate it when I put something in the crock pot in the morning and can smell garlic or onion on my hands the entire day. Great post! I forgot about the whole phone thing but you are 100% correct. Will try blowing up the gloves the next time my grandson comes over. Great idea. You need to show your grandson how to blow these up like a balloon! Oh, my. I thought I was the only one who does this. I like to use them especially when cutting up raw meat. After reading your ideas, I think I will be using gloves more often. You’ve got all of them, I have the same box in my chicken. My favorite use is for ‘picking’ a roast chicken…. I can’t stand chicken under my fingernails! Same here Piper. Absolute necessity on Thanksgiving. What great ideas!! I have used them before when using household cleaners, but you have brought these little wonders to new heights. I am out to pick up a box TODAY!!! Thanks! I was wondering about these types of gloves the other day – and you’ve demo’d some great uses! (Although, I have to admit, I read the lead sentence about them wrong and had to go back after I didn’t find the punch line as to why you used them if they “were not” to be used in the kitchen….oh, I hate it when I misread things!) I think I’ll invest in some of these gloves! Thanks for sharing! Paula, WOW! Putting exam gloves on my list. I have never used them before because I didn’t realize they were food safe. I tried the plastic ones for like when I changed the kitty litter, but they always slide off my hands and are too slippery. Thank you for letting us know about this! Definitely going to try this! I’m not a fan of the plastic ones either. They seem almost dangerous when chopping things with a knife and are definitely not for fine detail work where they keep slipping around. Granted the exam gloves are more expensive but since I don’t really use that many, it’s worth it. Yes, I think you’re right. After awhile, things just don’t feel right if you don’t have gloves own. Sally, you’re not the only one(along with Paula), that uses exam gloves daily. I use them at work every day, I do house cleaning for al loving, and have to use exam glove to avoid contamination from contamination and chemical exposure. It doesn’t feel rognt when you don’t have a say of gloves on. 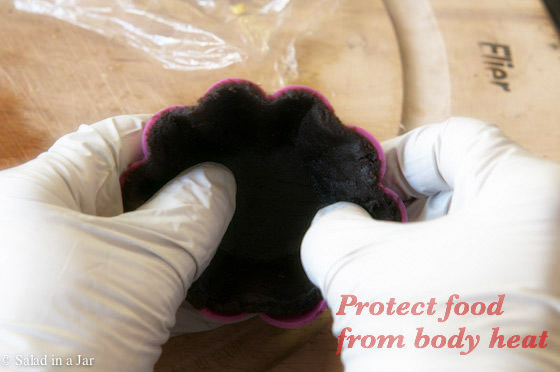 *I do household cleaning for a living, I use the glives to avoid contamination and chemical exposure. It doesn’t feel right when you don’t have a set of gloves on. Great post. I use the Nitrile gloves for washing dishes as I’m sensitive to latex. I never thought of them to help open jars. Thanks a lot. Thanks Donnella. My husband opens my jars if he’s around but often he’s not so this is easier than any jar opener I have. Clever ideas! I end up washing my hands a lot when I’m in the kitchen, so maybe I’ll need to try this out. Especially with garlic and onion – I feel like my hands smell like that too often! And I’ve definitely had the pepper seed hands in the eye; not fun! I’m definitely all for this if they’re vinyl. Working in the medical field I know latex probably tricky since many have a sensitivity to it and I wouldn’t really want to handle food with them. But, LOVE vinyl gloves 🙂 Use them for dyeing Easter Eggs every year as well. Oh, and you could add a #8 to your list; they make really fun balloons for kids when you blow them up and draw faces on them with sharpies! I keep a box of them in my kitchen too, although I have never used them for #1 or #2 on your list, I’ll have to remember & use them for those things as well!